Most of the seers and sages went through different phases of spiritual Sadhana and attained God realization at the end but Arunagirinathar attained realization and experienced the presence of Muruga at the very beginning. It is this experience, he explains in Kandhar Anubhuti. Kandhar Anubhuti is significant in another respect. While all other devotional works that loud the glory of Muruga, his abode, his weapon (Vel), transport (Mayil) and rooster (ensign), are objective in nature, Kandar Anubhuti, which speaks of Arunagiri’s own experience is subjective. What is experienced is purely personal and cannot be explained in words and yet Arunagirinathar has come forward to share his experience with us. We are therefore blessed to receive the nectar of what Arunagirinathar has experienced in the form of Kandhar Anubhuti. 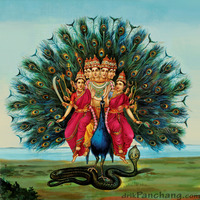 Lord Muruga appeared before Arunagirinathar as Guru and gave the advice on the eternal truth (Upadesa on Param Porul). Arunagirinathar says that as a result of this advice, he was elevated to the state of enlightenment. “Oh Muruga, because of your grace, I went through a new experience of speechlessness.” (Nesa Muruga Ninathu Anbu Arulal… Pesa Anubhuti Piranthathuve (28). We find reference to receiving the advice in another verse where he thanks the Lord for considering him fit enough to impart this rare advice. (“Aridhakiya Mei Porulukku Adiyen Urida Upadesam Unarthiyava”). Normally, one who receives the saintly advice and experiences the truth behind it cannot explain it or share it with anyone else. The aspirant should contemplate on the eternal truth, find it out and experience it himself. How fortunate we are that Arunagirinathar has come forward to share the advice he received from Muruga to us. In his song on Arumuga temple of Kutralam, the saint poet himself says that the Lord had invited him and blessed him to sing Anubhuti so that he can share it with other devotees (Adaikkala Porulam Ena Enai Azhaithu Muthiyadham Anubhuti Ena Arut Thiruppugazh Othuka). Almost every verse of Kandhar Anubhuti is the revelation of the advice which Lord Muruga has given him. Arunagirinathar has composed voluminous works on various aspects of God, the world and the human and the relation between these three aspects. Kandhar Anubhuti is the crest jewel, the quintessence of all his works. It is a gate-way to Jnana, the way to the path of liberation. While the narration and explanation of all the 51 verses of Kandhar Anubhuti would run into several pages, the author confines himself to three verses and makes an earnest attempt to understand their meaning. Here, Valli, the tribal girl, is being referred as Semman Magal. According to legend, she was aspiring to marry Muruga even from her previous birth. Muruga finds her and concealing his identity attempts to win her heart by various means. One night, Muruga sneaks into her house and physically takes her away without the knowledge of her foster father, Nambi Rajan. Arunagiri describes the act as a theft and calls the Lord ‘thief’. Here, Valli represents the Atman, the Self. Normally, the individual soul (Atman) aspires to unite with the Eternal Reality, (Paramatman) but here we find Arunagirinathar postulating a unique doctrine of Valli Sanmarga, where Paramatman himself, represented by Muruga, descends down to unite with the Atman. Arunagirinathar expresses delight and wonder at being advised by the Lord to ‘remain in silence’ in order to attain the same state of union. Remaining in silence without any word being spoken (“Summa Iru, Sol Ara”) is not a state of mere inactivity. The term silence referred by Arunagirinatha Swamigal is a state, where the mind and body ceases to function and the Self, pure consciousness alone remains. It is the state where the individual remains free from worldly thoughts and free from mental activity. Observing silence, looking inward and practicing ‘Siva Yoga’ paves the way for Self- realisation where the Jeevatma realises the eternal truth, Brahman. Arunagirinathar says he knows no other means to find God but the path of silence, solitude and stillness. Here, rather than describing what God is, Arunagirinathar describes Him what He is not. The God has no form but He is not formless either. He is not visible to the eyes but he is not without physical features either. He is not present but he is also not absent. As he radiates light, He is not darkness but he is not Light either. In short, He is indescribable or indefinable. According to Sri Pamban Swamigal, one who chants Anubhuti would find himself liberated from all worldly attachments. While reciting Anubhuti, the vagaries and vicissitudes of life, the fears and anxieties of mind would disappear and the devotee would enter into the Kingdom of God where peace and tranquility prevails. Thayumana Swamigal said: “When that day would dawn when I would have the divine experience as stated in Kandar Anubhuti and ever remain seeking the grace of Kanda” (Kandar Anubhuti Petru, Kandar Anubhuti Sonna, Enthai Arul Nadi Irukkum Nal Ennalo?). As the sun dawns, let us begin the day by reciting few lines from Kandar Anubhuti and derive strength and inspiration to face the challenges of life.